1) With pre-Harmony evolution technology, it is not possible to completely balance the braking system. The brakes "communicate" via the brake fluid. As this fluid is never coherent within itself, the complete communication which would facilitate perfect braking does not take place. In all countries where mandatory vehicle testing is carried out, there is a set tolerance for braking inefficiency. It is even recognised in legislation, that properly balanced braking is not possible. Unbalanced braking causes each wheel to be braked in its own way. It is rare for two wheels to brake identically and for all four to do so is recognised as impossible. The situation in which one (or, maybe, two) wheels are rolling to a stop but the others are being dragged along the road is the normal operating condition of every "unchipped" vehicle. Not only excessive tyre wear but also the rapid wearing out of the brake pads is the result. Because the Harmony Super Charger facilitates perfect information flow in the brake fluid, each brake receives exactly the right pressure and the wheels all brake together. This not only, obviously, eliminates a lot of tyre and brake pad wear (brake pads will often last 3 times as long as on an "unchipped" vehicle) but further has the added advantage of making your vehicle safer: If the braking system is working in balance, then your vehicle is not only much more likely to hold a perfect line, i.e. your control over your vehicle is better, but also your effective braking distance is likely to be shorter. It is much more difficult to "fishtail" a "chipped" vehicle. 2) When you drive your vehicle around a corner, each wheel "does its own thing", i.e. they don't work together - they don't inform each other about what is going on. This is actually what causes a vehicle to "wobble" when cornering. By ordering the entire informational structure of the vehicle, all the wheels become a single coherent system. This is why one has the feeling that a "chipped" vehicle goes around a corner "like it's on rails!" Instead of each wheel operating in isolation, the whole vehicle becomes a single, coherent informational structure. The elimination of the conflict situation whereby each wheel is, literally, going in a different direction eliminates a great deal of tyre wear as the wheels are no longer constantly being pulled back into line by the chassis. 3) When a rolling tyre meets the road surface, there is an initial "mismatching" between the road and the tyre. This causes the tyre to first slip before it grips. The road and the tyre are not really "communicating" and there is a constant, rolling "shock" effect as the tyre hits the road. Ordering the informational structure between the tyre and the road eliminates this "shock" and because both tyre and road "know" what is going to happen, the tyre does not slip unnecessarily any more. I appreciate that it can be a little difficult to "get one's head around" this concept - it is one of the ways in which scalar information technology, Quantum Field Theory and the Harmony evolution are all forcing a rethink of how the World really works. I have a Rover 827 car. It has, chipped, around 200 horse power (rather more than when I bought it). This is one of the front tyres. This photograph was taken in March 2006 after 18 months use. 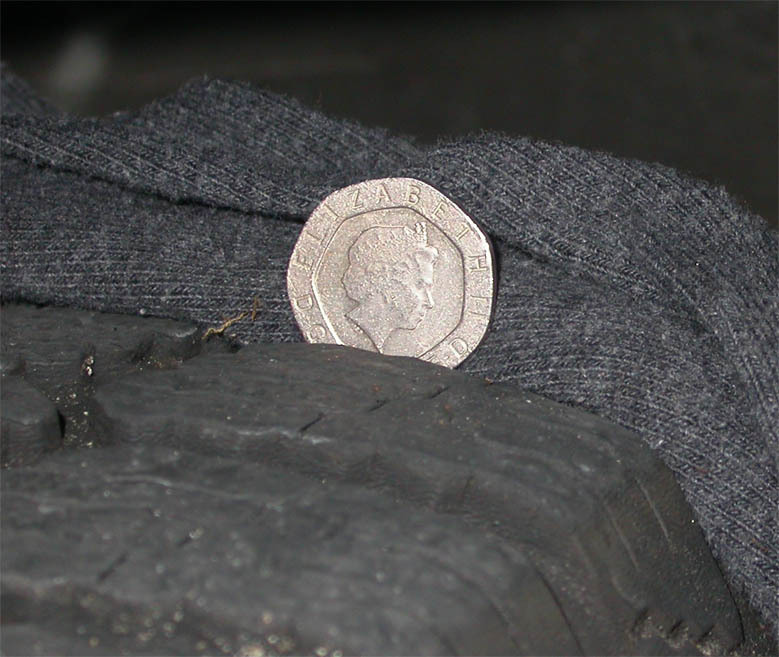 This is a close-up of the same tyre with a 20p piece to show the tread depth. In this photo, August 2006, the tyre is still in very good condition. See if you can guess how many miles this tyre has driven.